How much car traffic will a new building generate? Engineers and planners are constantly trying to divine the answer to this question in the belief that it will tell them the “right” number of parking spaces to build, or how to adjust streets to accommodate more cars. 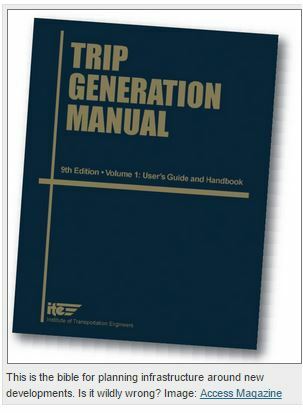 The standard reference to guide these decisions is the Trip Generation Manual published by the Institute for Transportation Engineers. But the manual has come under fire for overestimating the traffic produced by mixed-use developments. A team of transportation engineers aligned with the Congress for the New Urbanism has been working on a fix for that.